Ultras are funny things. Most of them are small, low key events without a lot of flash. If you run a marathon or a half marathon, you’ll get a big shiny medal. And each year they seem to get bigger and more elaborate. Ultras don’t typically give out finishers medals. That’s not to say you don’t get something, it’s just not a medal. I’ve received everything from pint glasses to backpacks to folding chairs for finishing 50K or 50 mile events. And it’s OK that they don’t pass out medals for these because that’s not really what running these races is all about for me. It’s quite ironic that the farther you go, the less important the finisher’s medal seems to become. I don’t mean to denigrate or disparage the accomplishment of finishing a half or full marathon. But the finisher rates for these are through the roof so there really isn’t much difference between a medal and the participant trophies that everyone mocks these days. But when you move up to ultras, there becomes a very real chance that you won’t be able to finish the race for any number of reasons. Not everyone makes it to the end so you would think the finishing token would be more important than it is. He looks lonely, no? I should go get him 99 more friends. That changes once you step up to the 100 mile distance. It’s become tradition that you get a belt buckle for finishing a 100 mile race. I believe this started at Western States, but I’m not 100% sure so don’t quote me on that. I’m not sure if every 100 mile race gives these out, but I haven’t read about one yet that doesn’t award a buckle for finishing under the cutoff time. Many races even give special belt buckles for finishing under a certain time. Oil Creek gives out a special buckle for finishing under 22 hours. So I just missed that by 4 plus hours. Ha. The uniqueness of the award is one of the things that draws me to these events. That’s not to say I wouldn’t run a race if they didn’t give out buckles. I don’t think the longer times races (24 hours, 3 day, etc.) award them, yet I plan on doing several of these at some point in the future. 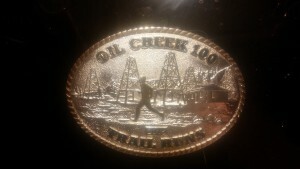 I’m not the type of person to slap a finisher sticker on my car, but I will wear my Oil Creek buckle out and about. It’s funny. I’d never wear a marathon medal around unless it’s immediately after a race (can you imagine being that guy? ), but I’ll wear a buckle showing that I finished a 100 mile race. Maybe because it’s like clothing. There’s nothing wrong with wearing your half marathon T-shirt so maybe it’s OK for me to sport my belt buckles in public. Just try not to stare too long if you see me wearing mine one day. Do you think a buckle is a cool finisher award or too pretentious? ← Why Am I Doing This To Myself?